We want you to meet Carol Lynne, our next BD Fishin’ Chick, as she shares her story about learning to love fishing. 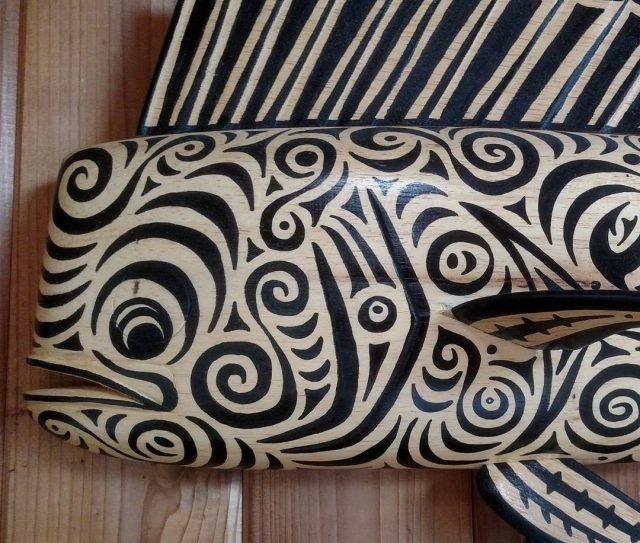 Carol Lynne: I am a marine-life artist with a style I call “tribal realism”. I am also an animal lover. I have always had a huge passion for the ocean. Carol Lynne: When I was going to college at Humboldt State a friend took me out salmon fishing and I loved it. After graduating I did a season of commercial crab fishing out of Eureka, California. Ten years after moving to Hawaii my Captain and now fiancé, Marlin Parker, hired me to help in dry dock. That turned into a hostess position on board and I was soon learning to help on the deck as well as feed people. 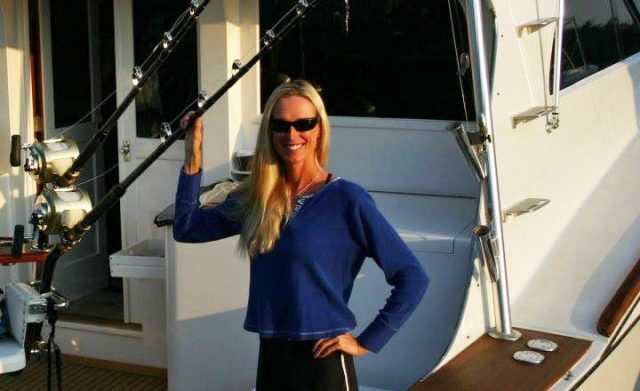 Carol Lynne: I’ve been charter fishing for 10.5 years but caught my first fish over 25 years ago. 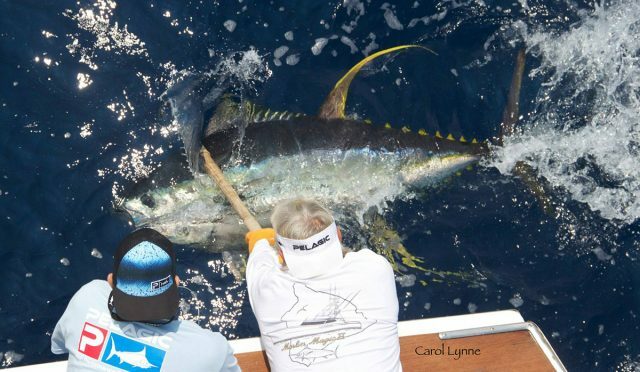 Carol Lynne: I really enjoyed my season of crab fishing but nothing can compare to the adrenaline and excitement of big game fishing!!!!!! 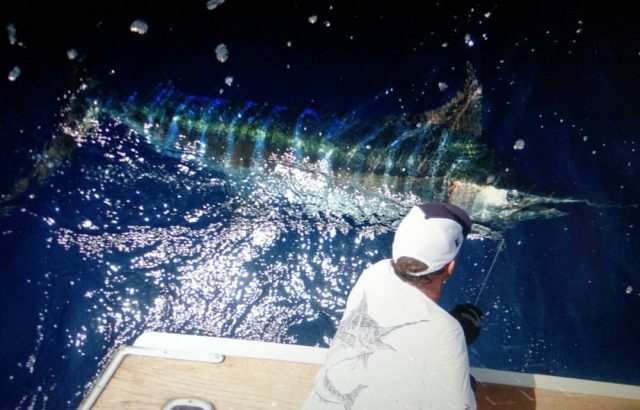 Seeing a giant blue jumping behind the boat is hard to beat!!!! 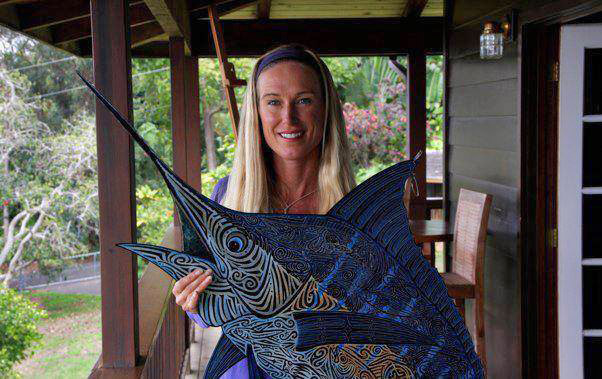 Carol Lynne: Hopefully get lucky and win some more tournaments, catch more big fish, capture more photos, and create more artwork. 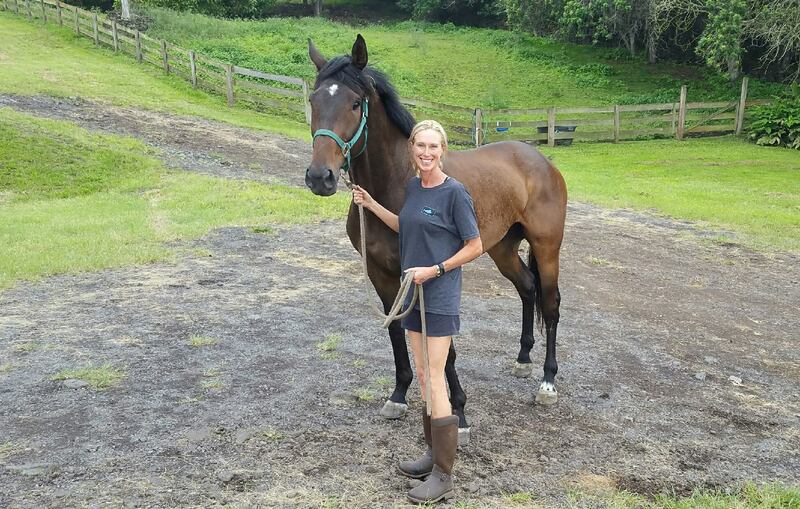 Carol Lynne: Everyday is different! 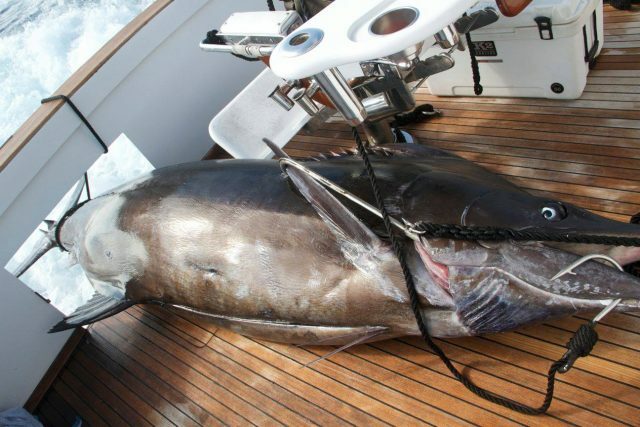 I love just being out on the water and knowing that any day we might get jumped on by a Grander is unreal! There is so much I love about fishing; It’s hard to pick just one thing! I get to meet amazing people and fish/work everyday with my best friend! Doesn’t get much better than that!!!! We were lucky enough to win the Bisbee’s Black and Blue tournament this year in Cabo. Carol Lynne: I got to work with an incredible group of guys and the whole experience was absolutely incredible and unforgettable! 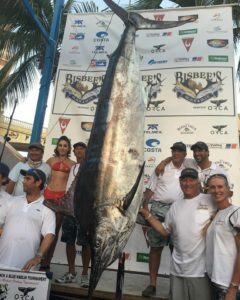 My good friend Julio Fernandez was the angler and seeing him catch the winning fish was epic!!!! About a month after we got home we had a no show charter. 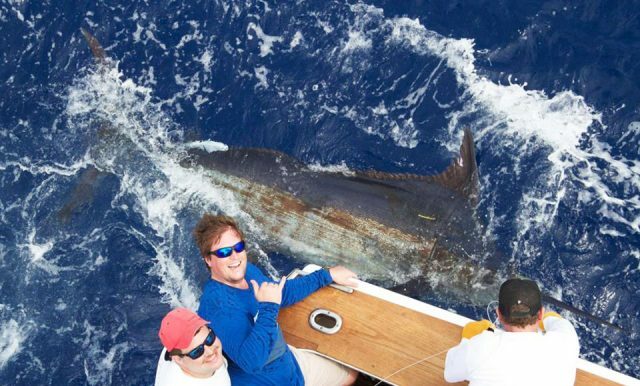 We wanted to take the boat out so Marlin said let’s go out and catch Carol a Grander. It was just Capt. Marlin Parker, crew Gabe Heflin and myself. I had the very rare opportunity to actually be an angler. I’m always working so I’ve only jumped in the chair a handful of times. 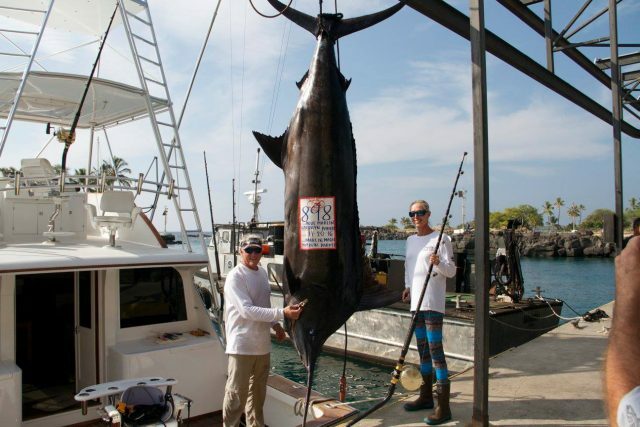 We got incredibly lucky and hooked an 898-pound blue marlin that ended up being the biggest weighed in Kona so far this year. Words can’t describe the joy I felt in the chair finally feeling the pressure of a big one!!! It was an hour and forty minute fight and there was not a dry spot on my body when it was done. 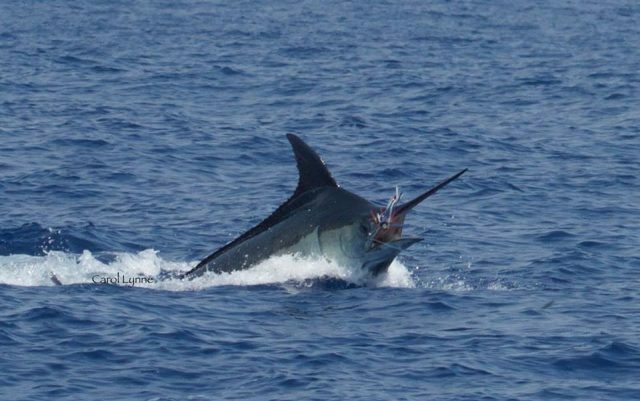 For years Marlin had wondered if my long skinny legs could handle the pressure of a big fish. He had over 50-pounds of drag on me for over half the fight. I was so happy my skinny legs didn’t buckle!!! Every time I think about it I can’t stop smiling! BD: What other “aspects of you” would you like to portray if any? Carol Lynne: On our trip to the Great Barrier Reef, our friend asked if I would mind taking photos. At home I always felt like I had way too much to do to on deck to be shooting. I was a guest so I said sure I’ll give it a try. Little did I know that would change everything!!! I always thought you miss so much looking through a camera but I soon learned you capture so much that you miss with the naked eye. Now shooting is a part of my work on the boat. As soon as we hook up I grab my camera and juggle between clearing lines and shooting. I am lucky to be third crew, which allows me to shoot after lines are cleared and when the fish is on leader. Now we all get to relive the experience and we try to get our angler out of the chair so they can stand next to their fish for a photo before we release it. 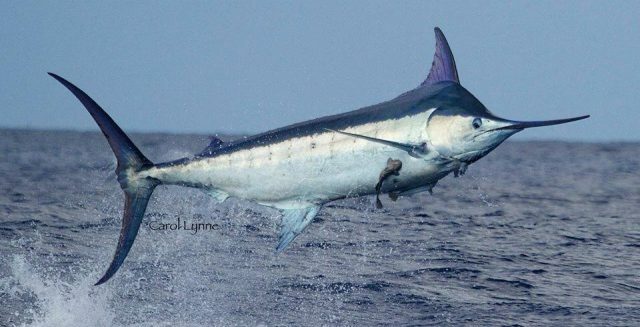 I love being able to capture the beauty of a jumping marlin and share the images with others. I have also been lucky enough to be a featured artist for Pelagic Gear! Our thanks to Carol Lynne and we wish her well in all her adventures. 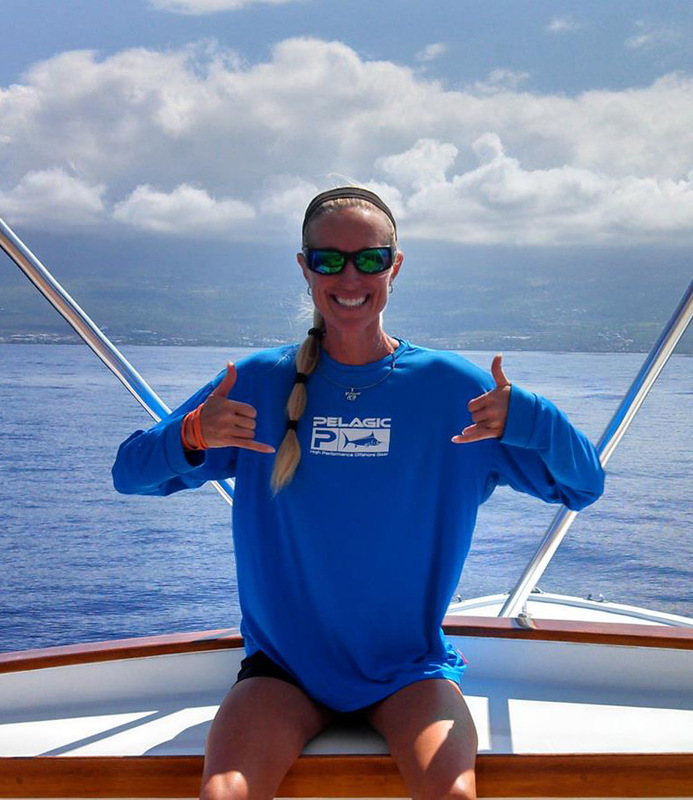 You can follow her on the Marlin Magic Facebook. 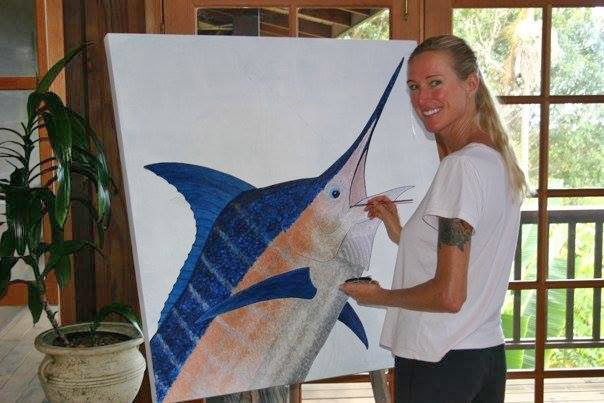 Check out her art on Fine Art America or you can fish with her on the Marlin Magic II.